Secular scientists claim that our universe formed itself in a big bang event about 13.8 billion years ago. They say that the big bang is a valid scientific theory, well-supported by the evidence. These claims are false. Not only is there abundant scientific evidence against the big bang, but the model also contradicts itself, and has absurd implications. In this third DVD in the series, engineer and former atheist Spike Psarris explores the origin of the universe. Did it form in a Big Bang event billions of years ago? Or are the heavens consistent with the biblical account of creation instead? Using spectacular graphics and brilliant photographs of God’s magnificent heavens, Spike demonstrates why the Big Bang fails scientifically. You’ll not only learn about the abundant scientific evidence against the Big Bang, but see why the model contradicts itself and has absurd implications. Spike makes difficult concepts easy to grasp, including redshifts, the cosmic microwave background radiation, the multiverse, and more. Plus, you’ll gain a deeper understanding of dark matter, dark energy, inflation theory, and the bizarre concept of a ‘Boltzmann brain’—all of which threaten the Big Bang’s status as a scientific theory. An objective evaluation of the evidence does not support a self-creation of the cosmos. Instead, “The heavens declare the glory of God” (Psalm 19:1). God the Father, God the Son and God the Holy Spirit are each equally and eternally the one true God. God is Love, is probably the most important claim Christians make about our Creator, and yet, without the Trinity it is incomprehensible. A perfectly loving Being cannot perfectly love if He is not sharing that love with at least one other, since perfect love exists between two distinct entities. Love demands a subject who loves and an object that is loved. Because God is immutable and self sufficient (His aseity) requires that His love is not dependent upon the existence of creatures (anything created). 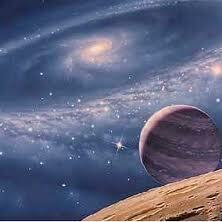 By observing the Universe God created, we can see this tri-unity expressed in every aspect of that creation. The Father is the Thought behind it, the Son is the Word calling it forth, and the Spirit is the Deed making it a reality. We are made in God’s image and in God’s likeness so is it any wonder we are a Trinity – Spirit, Soul and Body. Is it also any wonder, that God established the family, the basic structure for mankind as a Trinity – Husband, Wife and Children. God’s universe is a Trinity – Matter, Space and Time and each of these is a Trinity: Matter – Solid, Liquid and Gas, Space – width, height and depth and Time – past, present and future. God has given us so many wonderful examples in His creation of ONE being a TRINITY. Water is two atoms of Hydrogen and one atom of Oxygen (H2O) and it can be a solid – ice, liquid – water and gas- steam. Light – white is made up of three primary colours, red, green and blue. 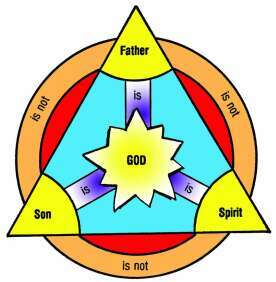 The three Persons of the Trinity appear in a logical, causal order . The Father is the unseen, omnipresent Source of all being, revealed in and by the Son, experienced in and by the Holy Spirit. The Son proceeds from the Father, and the Spirit from the Son. We “see” God and His great salvation by the Father sending the Son of God, our Lord Jesus Christ, we then “experience” their reality by faith, through the indwelling presence of His Holy Spirit. The truth of God’s tri-unity is ingrained in man’s very nature, but sadly he has often distorted it and substituted a false god or gods in its place. Chad Rodekohr earned a B.S. in Aviation Management, an M.S. in Physics, and a Ph.D. in Mechanical Engineering, all from Auburn University (Alabama). He is an Associate Professor of Physics at Presbyterian College in Clinton, South Carolina, where he and his wife are raising their five children. As a mechanical engineer and a physics professor, Dr Chad Rodekohr is passionate about the scientific method. Some might be surprised to find that he is also a biblical creationist. But he says that his career actually helps confirm the amazing design in the world. He was asked to explain how he handled disclosing his creationist views in the classroom as a student, and how he would advise students to handle it themselves. We need to bring academia back to the Lordship of Christ—gently and respectfully, being prepared at every step. Dr Markus Blietz was born in Germany in 1962, and studied physics at the Technical University in München (Munich). In 1994 he earned his Ph.D. in astrophysics at the Max Planck Institute for Extraterrestrial Physics in Garching (near Munich). He now works in the semiconductor industry as a patent manager, helping researchers to develop and patent new ideas. In spring 2008, he was born again, and since then has been a keen supporter of Creation Ministries. 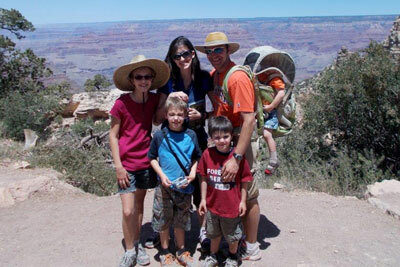 Dr Blietz and his wife Alexandra have two children and reside in a small town in Bavaria (Germany), not far away from Salzburg (Austria). The educational and media system often contrast ‘creationists’ and ‘scientists’. But in every issue of Creation magazine they prove them wrong with an interview with a highly qualified scientist who is also a creationist. Not too many of them have been astronomers or astrophysicists like Dr Blietz. God conceived, created, defined, rules, and judges the entire universe. God alone is ultimate. Therefore, creation and all creatures (including us!) are derived and dependent. That is why Genesis 1:1 is the most offensive verse in the Bible. If this verse is true, then every premise and postulate of the world’s wisdom is a lie. This is why men respond in such fury against even the obvious – the universe demonstrates Intelligent Design. If there’s a Designer, then I am not ultimate—and if that is the case, everything collapses. God is Lord, on His throne. 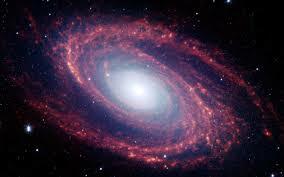 He designed and created the original universe, which was ruined by sin. God will design and create the new heavens and new earth. So we see here: God’s words (not Satan’s, not ours) that are faithful and true, and God’s deeds (not Satan’s, not ours) that are final and determinative. Worldly wisdom is false, temporary, and doomed. Our only hope lies in the wisdom of God, which centres in the cross of Jesus Christ. We must turn from the pipe-dream of our own ultimacy, bow before the ultimacy of the Lord God. It is only when we start from God’s ultimacy, and the sufficiency of His Word, that we have any hope of true wisdom and knowledge (Proverbs 1:7; 9:10). Dr Michael Guillen – do you believe every word in the Bible? Yes I do, he says. So who is Dr Michael Guillen? He was born in East Los Angeles, earned his BS from UCLA and his MS and PhD from Cornell University in physics, mathematics and astronomy. For eight years he was an award-winning physics instructor at Harvard University. For fourteen years he was the Emmy-award-winning science correspondent for ABC News, appearing regularly on Good Morning America, 20/20, Nightline, and World News Tonight. Have I read the Bible cover to cover? Yes, I have (as well as the sacred literature of other religions), more than once and in different translations. Do I understand every word of the Bible? No, I don’t but believe every word, yes I do. Having faith in something I don’t completely understand is not limited to my spiritual life; it’s also true of my relationship to science and rational thought. Science and logic cannot explain everything about the universe – especially since more than 90% of the cosmos is invisible to us – nevertheless, I believe in them so much I dedicated my career to their practice. It takes humility to admit that to seemingly intractable problems there are many possible solutions we haven’t thought of yet, and might never think of in this life. It takes humility to have faith in something of everlasting importance that you don’t completely understand yet and can’t possibly, given its infinite nature and our finite capacities. It takes humility, above all, not to jump to any conclusions about what isn’t possible in this glorious, mysterious universe of ours … and what is. For more information, go to www.michaelguillen.com or get his book Can a Smart Person Believe in God?